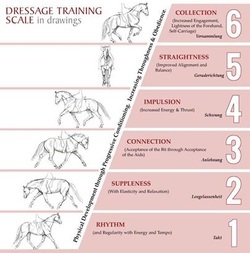 In classical dressage the training scale has been developed over time by individuals that have dedicated themselves to the discipline: The Masters. The building blocks of the training pyramid are interdependent and interwoven. Each stage needs to be mastered by guiding the horse before moving onto the next. Once mastered, lower blocks should frequently be revisited to assure they are genuine. There are three phases in the progression of training. First the horse is encouraged to find his natural balance while carrying a rider. Relaxation is encouraged. He is allowed to find his natural rhythm and seek a light elastic connection with his rider through the reins. Second – thrust from the hindquarters is developed and is reflected by impulsion and straightness. Lastly, collection or the development of carrying his weight on the hind quarters is developed resulting in a lightness of the forehand. There are numerous works written by classical theorist and masters which one may visit to increase their understanding and ability to progress through the stages above. Please visit our ﻿Masters and Theorist Page for more information on publications.